All-Star Movies is arguably the best of the three resorts. Under the umbrella name "All-Star Resorts" are three seperate resorts themed to Sports, Music and Movies. (Uncoincidentally, all Disney Movies.) Each is composed of 10, 3-story, independently standing "T" shaped building structures grouped in twos, with each group having a different "sub-theme". (For instance the five groups at All-Star Music is Calypso, Rock, Jazz, Country and Broadway.) 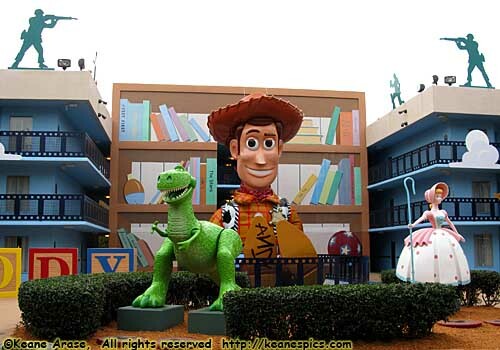 While different areas of the moderate resorts pretty much look alike, each sub-theme at Values screams the exterior themeing to the point of garishness. I admit it does make it much easier to remember where your room is. There is also an 11th building, which holds the check-in area, food court (there is no table service at a value resort), game room, souvenier store, Guest Services, etc. While each resort is identical in terms of capacity and amenities, the layout of the buildings are custom to each resort. The resort with the best layout is Movies, where buildings surround three sides of the food court/bus stop area; and the worst Music, due to the linear fashion the resort, where the farthest buildings from the food and buses, really are far. And while all three resorts are "All-Star Resorts", the only thing they have in common is the parking lots between them. And sometimes the buses depending on demand. Each has their own registration areas and room number space, food court, pools, bus areas, etc, making each resort a truly independent resort. Typical room interior. Minus my suitcase, of course. I have only stayed in a value room with two people at most, and still find space is tight. Of course, I bring more stuff with me because I drive. Even so, with four people in a room, I'm not even sure where you'd put all your luggage. I've stayed at All-Stars twice. Once at Sports and once at Music. 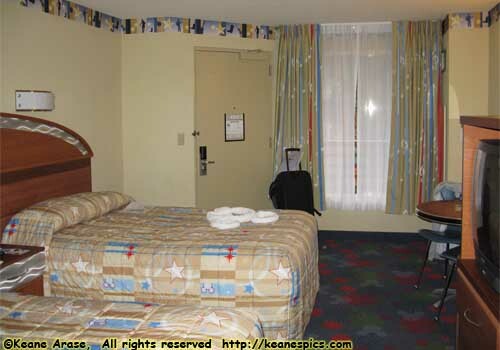 Each time I got a room that was one room from being the furthest from the parking lots and the food court/bus stops. Now, if that just sounds like I'm complaining, well, your right. I'm complaining. In conclusion, though I don't care for this particular resort, I would still stay here before going off-site. In fairness, I'm not sure my complaints about the resort would matter that much to anyone who's going to be in the parks 14 hours a day, and only use the room to sleep and shower. There's also the fact that many times you'll get some pretty good deals at the Value hotels. I have yet to stay at Pop Century, but I've stayed at a Value room at Art of Animation for a full week, which I also felt was lacking. Given the placement of the value rooms within the Art of Animation complex, I would recommend a preferred All-Star Resorts room over Art of Animation value room. End All-Star Resorts - Overview.